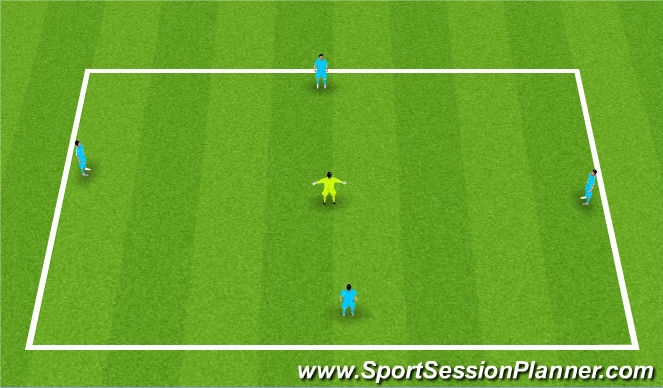 Descritption: Groups of 3 players pass the ball between them. On coaches command the 2 players in the group of 3 that dont have the ball go and pressure the opposite groups player that has the ball. So have multiple groups, blue would work against yellow with red shorts, purple would work against yellow. Description: 4v1 rondo. If the defender wins the ball they try to dribble out of the grid on any side. The blue team when they lose possession tries to win the ball back. Work on 1st defender immediate pressure 2nd and 3rd defenders covering behind the 1st defender. Teach when multiple defenders can pressure and when to cover in behind. Add a defender and make space bigger. Set Up: Each playing space it about 25x15 Teams are divided equally. Two 1v1 games going on a same time. Each team attacks the opponents goal. If the purple wins the ball they try to score. If the ball goes out of bounds a new blue will attack and new purple will defend. 3. 1st defender trys to recover the ball. If the blue loses the ball a second blue player can run on to help pressure and win the ball quickly. Purple Team starts with the ball and attacks 2 small goals. Blue team wins the ball and counters to opposite 2 small goals. Purple is numbers up and work on counter defense to win the ball back quickly. 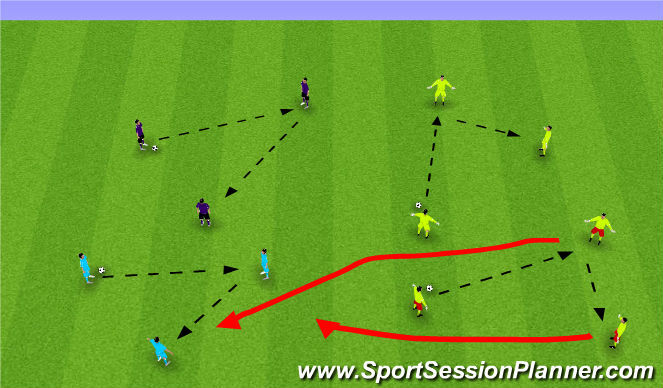 Description: 5v4 Ball starts with the 5 attacking players (purple), they are looking to score in either goal. If the 4 (blue) defenders win the ball they try to keep the ball from purple, blue can use the GK to keep ball as well. The purple team, if the lose the ball they try to win the ball back as quick as possible and score in either goal. Change players roles in this Activity.